Hermes is the son of Zeus and Maia who was a nymph, one of the Pleiades, daughters of Atlas, taking refuge in a cave of Mount Kyllini in Arcadia. Hermes was born on Mount Kyllini in Arcadia. On his first day he escaped from the blanket that his mother had wrapped around him and went to Thessaly where he stole some cattle from Apollo's herd and hid in a cave where he created his first lyre from a cow' s intestines and a tortoise shell. Apollo complained to Maia that her son had stolen his cattle, but Hermes had already returned in his mother's blanket so she refused to believe Apollo's accusations. Zeus took the side of Apollo but when Hermes began to play music on the lyre that he had invented, Apollo, a god of music, fell in love with the instrument and offered to allow exchange of the cattle for the lyre. Hence, Apollo became a master of the lyre and Hermes invented the syrinx, a pipe-instrument which was also acquired by Apollo later on by exchanging it with a caduceus. 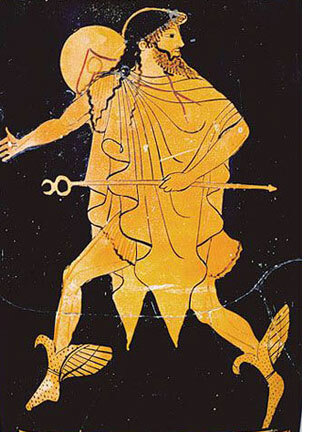 Hermes is Zeus' messenger. He is the fastest of the gods. He wears winged sandals, a winged hat and carries a magic wand. He is the god of thieves and commerce. He is the guide for the dead to go to the underworld. Apart from the lyre he invented, the pipes, the musical scale, astronomy, weights and measures, boxing, gymnastics and the care of olive trees. He is also the Olympian god of boundaries and travelers who cross them, of shepherds and cowherds, of orators and wit, of literature and poets. Hermes had many children and one of them was Pan, the satyr-like Greek goat of nature, shepherds and flocks, who was often said to be the son of Hermes through the nymph Dryope. In the Homeric Hymn to Pan, Pan's mother ran away from the newborn god in sight over his goat-like appearance. Hermaphroditus, another son of Hermes, was an immortal son of Hermes through Aphrodite. He was changed into an intersex person when the gods literally granted the nymph Salmacis' wish that they never separate. Eros, the mischievous winged god of love, son of Aphrodite. Tyche, the goddess of luck, Abderus, who was devoured by the Mares of Diomedes and Autolycus, the Prince of Thieves.